During 29 October-1 November the VI Ordinary Session of the Euronest PA took place in Kyiv, Ukraine. The representatives of the European Parliament and the parliaments of EaP countries participated in the event. Also, the representatives of EaP Civil Society Forum took part in the session, in particular, the Co-Chairs Hennadiy Maksak (UNP National Facilitator) and Dovilė Šukytė. Also, in the Women Forum which was held under VI Ordinary Session of the Euronest PA, took part Yulia Savelieva (NGO “Women Consortium of Ukraine”, WG1 UNP). The Euronest Parliamentary Assembly is a parliamentary forum to promote political association and further economic integration between the European Union and the Eastern European Partners. Euronest is to contribute to the strengthening, development and visibility of the Eastern Partnership, as the institution responsible for parliamentary consultation, supervision and monitoring. According to the Euronest PA’s Charter, The Euronest PA meets once a year, alternately in an Eastern European Partner country and on the premises of the European Parliament in one of its places of work (Brussels, Luxembourg or Strasbourg). In Ukraine such a meeting has held for the first time. The detailed programme of VI Ordinary Session of the Euronest PA in Kyiv is available via this link. Hennadiy Maksak, EaP CSF Co–Chair in his speech at the plenary session stressed the deepening of relationships between the Euronest and EaP Civil Society Forum as two crucial pillars of the Eastern Partnership multilateral track. He called upon all the sides for cooperation in development of the EaP policy which would meet the aspirations of Partner Countries and expectations of their societies. He mentioned about the Civil Society Declaration which was adopted at the EaP CSF Annual Assembly and expressed a hope that that some of its estimations and proposals will be recognized in the final documents of the Euronest PA’s session. The Co–Chairs of the Euronest PA Rebecca Harms and Marian Lupu addressed the participants with the welcoming speeches. Marian Lupu stressed that the discussions under the Euronest PA including the session in Kyiv “lead us to the idea of two-speed Eastern Partnership”. As Marian Lupu said, some countries have signed the Association Treatments with the EU, other countries, possibly, will have other types of treatments. He assured, however, that despite different formats of cooperation, “we should maintain the united platform and be oriented towards the common interests”. 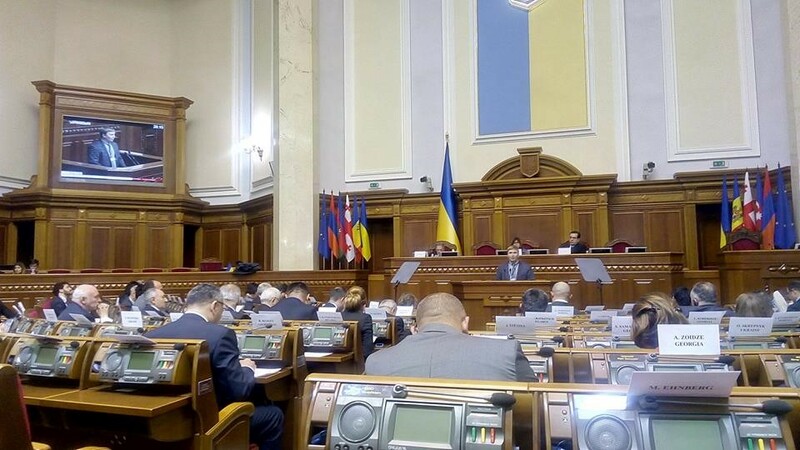 During VI session of the Euronest PA such topics have been mainly discussed: freedom and integrity of mass media, cybersecurity in the EaP countries and EU, electoral reforms, youth unemployment, women at the labour market, energetic component of implementation of the Paris climate agreement. Among numerous meetings and events envisaged by the programme of VI session of the Euronest PA, the meetings of 4 Assembly’s Committees are worthy of mentioning (October 30): the Committee on Political Affairs, Human Rights and Democracy, the Committee on Economic Integration, Legal Approximation and Convergence with EU Policies, the Committee on Energy Security, and the Committee on Social Affairs, Education, Culture and Civil Society. At all the meetings the prospects of the Eastern Partnership prior to the EaP Summit in the end of November 2017, as well as the key tasks envisaged by the “Eap 20 Deliverables for 2020” in corresponding areas have been discussed. The participants also discussed the plans of activities for 2018 and the drafts of resolutions which were then adopted at the plenary session of the Euronest PA.
On October 30 the Women’s Forum was held under the VI Ordinary session of the Euronest PA. The participants of the Forum discussed a range of issues related to women’s rights and gender equality. In the discussion took part Yulia Savelieva, representative of the EaP CSF Ukrainian National Platform (NGO “Women’s Consortium of Ukraine”), co-author of the chapter on gender issues of the study “Ukraine in the coordinates of the Eastern Partnership 2017-2020” (expert assessment of the Joint Staff Working Document “Eastern Partnership – 20 Deliverables for 2020” which was held by the UNP experts). – prospects of ratification of the Istambul Convention in Ukraine, and the imprortance of implementation of this document for all Partner Countries. Also, at the meeting the political declaration on behalf of the Women’s Forum was adopted. On October 31 the meeting of the Ad Hoc Working Group on Association Agreements took place. The participants exchanged their experience on adaptation and implementation of the legislation related to the separate chapter of the Association Agreements in three associated countries. Also, at this day the informal meetings with the representatives of the political families took place (European People’s Party, Progressive Alliance of Socialists and Democrats, Alliance of Liberals and Democrats for Europe, European Conservatives and Reformists, European United Left–Nordic Green Left). On October 31 and November 1 the plenary session of the Euronest PA took place. The main attention has been drawn to counteracting hybrid threats and cybersecurity in the EaP countries. Resolution on Lethal autonomous weapons systems EN.